Can mindful meditation reverse brain aging? As we age our brain slowly starts shrinking (and this starts by the age of 25), can we do anything to help slow or reverse this process? Could something as relaxing as meditation help stop the loss of your brain mass? A few days ago I told you about research that indicated that walking 40 minutes a day 3 days a week (for 1 year) reversed brain aging in subjects over 55. The study we will discuss today used 8 weeks of meditative training and practice and the researchers examined the size of various brain regions (using a brain scan) and compared the meditators versus a control group at the end of the 8 week time period, compared to their results before the experiment started. Formal mindfulness training exercises aim at developing the capacity for mindfulness (awareness of present-moment experiences with a compassionate, non-judgmental stance) and include a body scan, mindful yoga, and sitting meditation. The mindfulness experimental group was also instructed to try to enter a mindfulness state while doing some daily activities like washing the dishes, eating, walking, or showering. Additionally, the mindfulness subjects received a 45 minute guided meditative audio to assist in their meditation. However, the actual average time spent doing their mindfulness homework (meditation) was 27 minutes a day. So even if you add in the weekly 2.5 hour training, and the 6.5 hour one time whole day training you come up with spending on average 55 minutes a day on mindfulness. You can take this as their time commitment for this program. You can see in these four brain regions depicted in the graphs above the mindfulness trained group have greater positive changes in their selected brain volumes compared to the control group. 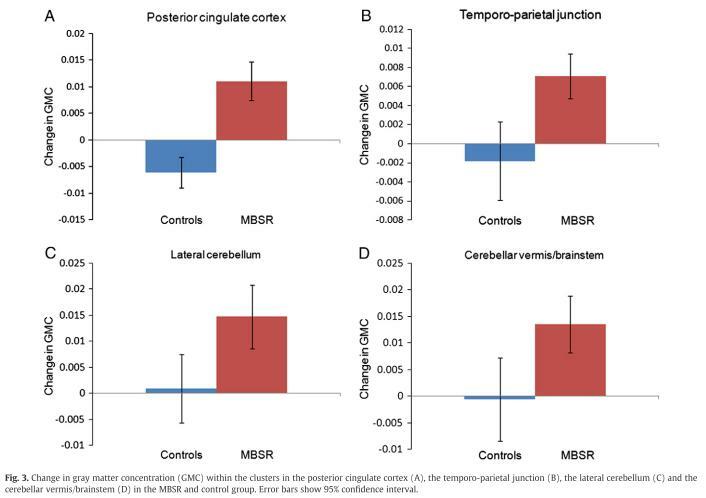 You might also notice that in the control group not all of these brain regions shrank as you might have thought based on the previous study we discussed. But compared to the study we talked about last week these subjects were younger (38 vs in the walking study an average age of 67) and the time period was shorter (8 weeks vs 1 year). In the walking study they found a difference in the hippocampus size which is important for memory formation. This mindfulness study also examined this important region and found a difference between the groups for the left hippocampus, with the mindfulness group displaying better results. Mindfulness meditation appears to change the volume of several brain regions after just 8 weeks of meditation. What is really interesting is that this occurs in fairly young people (average age 38). Last week we talked about how 40 minutes of walking 3 days a week for 1 year also has a very nice effect on hippocampus brain size in older subjects (average age 67), it reversed the normal shrinkage of this brain region which occurs as we age. So now we have at least two techniques we can use to help to reduce the loss of age related loss of your brain. Why not use both? Try exercising several times a week, and add a daily, or near daily, mindful meditation. What do you got to lose – maybe your brain matter if you don’t do something about it.